I have enough nail varnishes to sink a battleship, yet still I lust after more. Mavala is a range I’d never used before but had seen out and about on the shelves of John Lewis and such like. 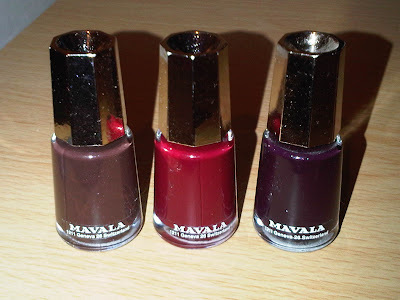 They were kind enough to send me their Autumn collection to try, and although the colours aren’t revolutionary or any different from the millions out there, I like them. There’s a deep, slightly shimmery, purple shade which will do you all the way through to Spring, a gorgeous almost-black brown shade which goes with anything, and a surprisingly bright red colour which is bound to become a classic. The dark colours come out darker than in the bottle and the red brighter, so make sure you find a tester if you’re buying from the range. 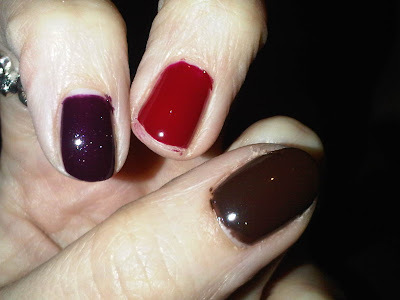 They apply easily and, although the formula is quite runny, look pretty top notch after only one coat. The shades also dry pretty quickly (5 mins and they’re touch/smudge proof) and the finish is super shiny so you don’t even need a top coat if you don’t fancy going fancy. What I do love about these polishes though is the size… How often have you actually use a full size polish from start to finish? How often do you drag a load of rattling shades away with you for a weekend and double the weight of your case? If you, like me, wish for a solution then these mini bottles are spot on. Perfectly sized to hold enough formula whilst not taking up the same room as a small animal, they’re still easy to use and they don’t scrimp on the brush quality. I looooove these polishes! I bought a ton when I was in Switzerland, they had a crazy number of colours to choose from. I love that I can experiment with different colours without having to fork out so much for a decent polish. I know, they're really cheap – like a fiver. I love the fact that they're small too… I have so many polishes they weigh a ton and take up so much room.